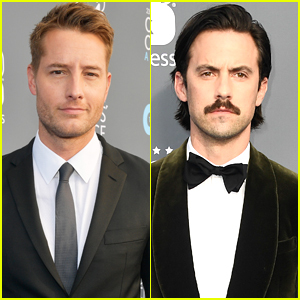 Justin Hartley & Milo Ventimiglia Look So Handsome at Critics' Choice Awards 2018! Justin Hartley smolders on the blue carpet as he arrives at the 2018 Critics’ Choice Awards held at The Barker Hangar on Thursday (January 11) in Santa Monica, Calif. The 40-year-old actor was joined at the awards show by his This Is Us co-stars Milo Ventimiglia and Susan Kelechi Watson. Other stars at the event included Billions‘ Asia Kate Dillon, Godless‘ Audrey Moore, Sneaky Pete‘s Margo Martindale and Marin Ireland, and The Americans‘ Alison Wright. You can check out the full list of winners from the awards show here! FYI: Milo is wearing Ralph Lauren Purple Label. Susan is wearing an Iris Serban dress, Le Silla sandals, and a Helio Polis clutch. Audrey is wearing a C/Meo Collection dress, Cole Haan shoes, a Sondra Roberts bag, Zoe Chinco earrings, and a vintage necklace. Marin is wearing BaubleBar earrings. Alison is wearing a Pronovias dress. Michelle Dockery & Jack O'Connell Celebrate 'Godless' Premiere in NYC - Watch Trailer! Michelle Dockery rocks a jumpsuit as she hits the red carpet at the premiere of her new Netflix series Godless held at The Metrograph on Sunday (November 19) in New York City. The 35-year-old actress was joined at the event by her co-stars Jack O’Connell, Jeff Daniels, Adam David Thompson, Audrey Moore, Kim Coates, Kayli Carter, Christiane Seidel, Jessica Sula, Cindy Holland, Merritt Wever, Thomas Brodie-Sangster, Samuel Marty, Elisa Perry and writer-director Scott Frank. Godless follows the fates of Frank Griffin and his murderous gang… of Roy Goode, the member who turned against them… and of La Belle, the town full of women who must defend themselves when they get caught in the crossfire. Welcome to Godless country. The Netflix limited series arrives on November 22 – Watch the trailer below! FYI: Michelle is wearing a Galvan jumpsuit. Jessica is wearing Imagine Vince Camuto heels.